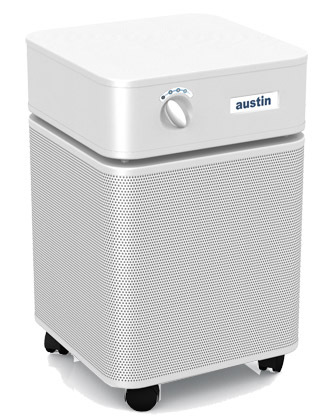 Austin Air ™ is a Buffalo, NY based manufacturer of high quality air purifiers. Today, at 480,00 square feet, Austin Air™ has the largest air cleaner manufacturing facility in the world, producing everything in-house from filter, to metal forming, to the final paint. 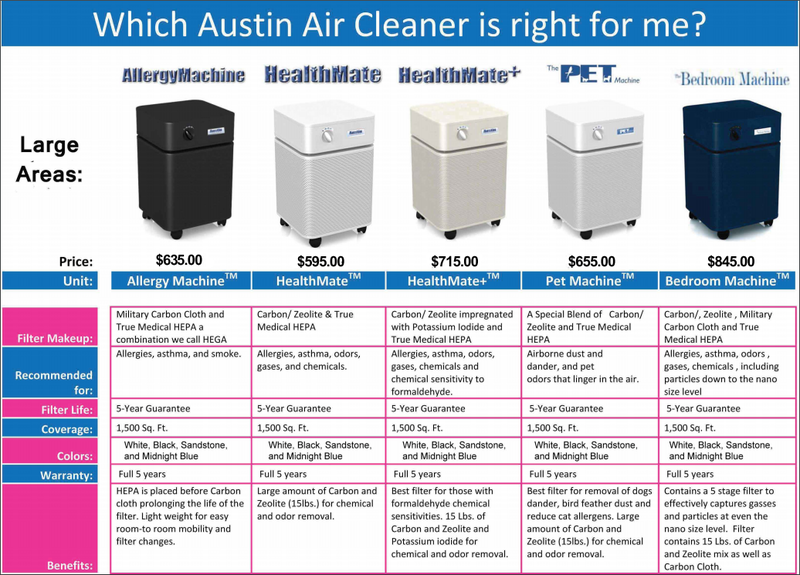 The Austin Air ™ Healthmate™ is the air cleaner of choice by leading doctors throughout the United States and many parts of the world. Austin Air™ Purifiers are clinically proven for Asthma, COPD, Severe Allergies, Chemical Sensitivity and Sleep Apnea. There are a variety of models that target specific air purification and health goals. 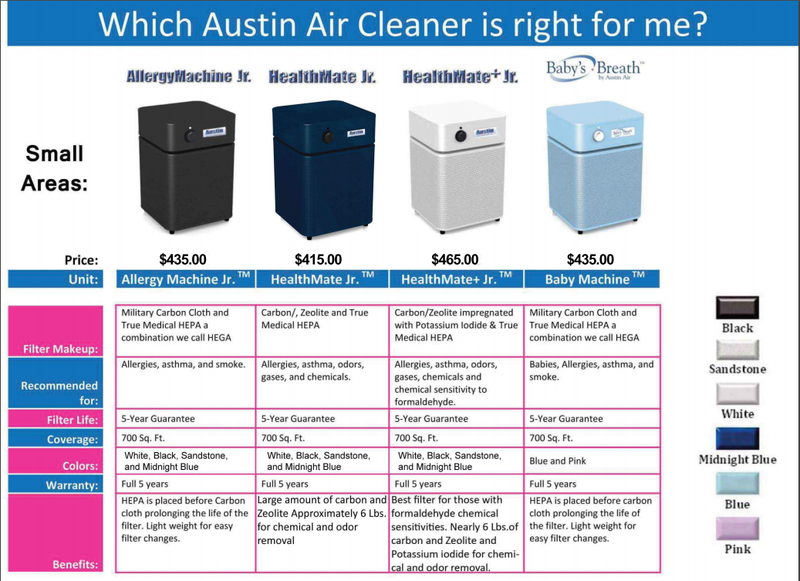 Purchase Austin Air Products Directly from our Website and Register Your Products Online..
Healthmate™: Specialty air cleaner with 60 sq. ft. of medical HEPA, certified to remove 99.97% of airborne particles 0.3 microns and larger. Contains 15 pounds of granular carbon and zeolite for the adsorption of odors, gasses and chemicals. Stands 23” tall and 14.5” wide. Comes with wheels for easy portability. Effectively cleans an area of 1500 sq. ft. (with normal ceiling heights). Available in white, sandstone, and black. Healthmate Junior™: Specialty air cleaner with 30 sq. ft. of medical HEPA, certified to remove 99.97% of airborne particles 0.3 microns or larger. Contains 7 pounds of granular carbon and zeolite for the adsorption of odors, gasses and chemicals. Stands 16.5” tall and 11” wide. Effectively cleans an area of 700 sq. ft. (with normal ceiling heights). Available in white, sandstone, and black. Healthmate Plus™: Specialty air cleaner specifically designed for those who are chemically sensitive. Has 60 sq. ft. of medical HEPA, certified to remove 99.97% of airborne particles 0.3 microns or larger. Contains 15 pounds of granular carbon and zeolite for the adsorption of odors, gasses, and chemicals. The carbon in this filter is impregnated with potassium iodide for the removal of additional chemicals. Stands 23” tall and 14.5” wide. Comes with wheels for easy portability. Effectively cleans an area of 1500 sq. ft. (with normal ceiling heights). Available in white, sandstone, and black. 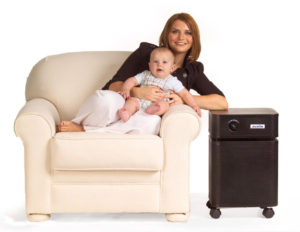 Healthmate Junior Plus™: Specialty air cleaner with 30 sq. ft. of medical HEPA, certified to remove 99.97% of airborne particles 0.3 microns or larger. Contains 7 pounds of granular carbon and zeolite for the adsorption of odors, gasses and chemicals. The carbon in this filter is impregnated with potassium iodide for the removal of additional chemicals. Stands 16.5” tall and 11” wide. Effectively cleans an area of 700 sq. ft. (with normal ceiling heights). Available in white, sandstone, and black. white, sandstone, and black. Bio-4000 available in Passion Purple, Heritage Green and Davenport Tan..
Baby’s Breath / Healthmate Junior HEGA™: Specialty air cleaner with 30 sq. ft. of medical HEPA, certified to remove 99.97% of airborne particles 0.3 microns or larger. A military carbon cloth is used in place of granular carbon, and is located after the HEPA, enabling the carbon to be more efficient. Stands 16.5” tall and 11” wide. Effectively cleans an area of 700 sq. ft. (with normal ceiling heights). Baby’s Breath available in blue and pink. HM Junior HEGA available in white, sandstone, and black.